War Legion are a band from Colombia that plays a very raw and satanic form of black metal and this is a review of their self released 2016 album "Gran Satanas". A very war orientated sounding intro starts off the album before going into more of a fast and raw black metal direction that also utilizes a great amount of tremolo picking and blast beats along with a great amount of high pitched screams and the music is heavily rooted in the 90's. Ritualistic spoken word samples are also used briefly and you can also hear all of the musical instruments that are present on the recording and as the album progresses a small amount of melody can be heard in the guitar riffing and all of the songs stick to a very heavy musical direction. War Legion plays a style of black metal t hat is very fast and aggressive with a touch of war metal, the production sounds very raw and heavy while the lyrics are written in Spanish and cover Satanism, War, and Anti Christianity themes. 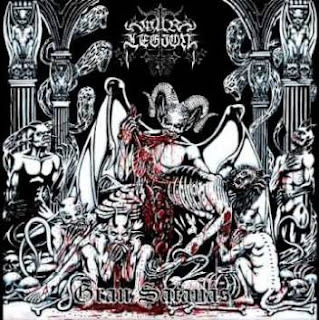 In my opinion War Legion are a very great sounding fast and raw black/war metal band and if you are a fan of this musical genre, you should check out this recording. RECOMMENDED TRACKS INCLUDE "Abismo Metal" and "Destroying The Enemy". 8 out of 10.